Hotel La Perla Corvara is a fantastic family-run hotel in the town of Corvara, Italy, nestled in a valley surrounded by the Dolomites. This is one of the best hotels I have ever stayed in because of outstanding service, the rooms, the fabulous spa, and the terrific food served in the hotel’s restaurants. (1) Service: This is a family-run hotel so members of the family welcome you at the restaurants and at the early evening cocktails (Note: They hold these cocktails every now and then, and they serve good wines from the region, charcuterie, cheese and other small dishes. It’s a good way to meet other guests and get tips on where to hike, what to do in the area). Not only that, the hotel actually organises day hikes which you can join. They also organise bike tours, if you’d rather explore the region on two wheels. The staff are devoted to ensuring that you enjoy your stay and find the best hiking and biking routes. (2) Comfortable, cozy room with large bathroom: The rooms have large comfortable beds and some have great views over the valley and the mountain peaks. I had a junior suite with a large bathroom and a balcony (see my view below). Everything worked — powerful shower, large bathtub, lots of light in the bathroom. The room was very quiet. This is the perfect place to relax. (3) Spa with swimming pool: In the basement of the hotel, there is a large spa with a swimming pool and artificial waterfalls. Not only that, there is a Turkish steam bath, dry sauna, herbal sauna and quiet relaxing rooms. After hiking (or skiing) in the mountains, there’s nothing better than having a swim and heading for the sauna and Turkish bath. They also offer massages and beauty treatments. (4) Restaurants: There are 2 restaurants at the hotel. The Stüa di Michil is the “fine dining” restaurant serving refined local cuisine. It has been awarded one Michelin star. The other restaurant is the Murin Tavern, which is more informal but serves equally delicious food. In the winter, the uppermost floor of the Murin functions as the après-ski bar. Make sure you end your meals with a glass of grappa made by one of the family members. (5) Pinarello Lounge: If you love cycling, you will appreciate the hotel’s Dogma Pinarello Passionate Lounge. Not only can you rent a bike, you can also sign up for one of their bike tours. They provide cycling routes in the area so you can get the most out of your stay. Even if you don’t cycle much, you will appreciate the beauty of the Pinarello bikes on display. (6) Breakfast buffet: You will find tables filled with cakes, breads, cheeses from the region, fresh fruit, charcuterie, jams, muesli and other cereals, yogurt, milk, juices and if you want something warm, you can order omelettes, poached or fried eggs. It’s great that they offer such a wonderful breakfast to people who are going to hike or ski all day. During my stay, breakfast was included in the price of the room. (7) Location: Hotel La Perla is located right in the village of Corvara within walking distance from shops, restaurants, bars and supermarkets. It is on the side of a hill so you do look over the valley. I came to the Dolomites in July for four days to hike and enjoy the mountain scenery and the fresh air. After just one day, I wondered why on earth I had never been to the Dolomites. Apart from the stunning scenery, the food is terrific and the people are warm and welcoming. They speak a dialect called Ladin. Corvara is located in a region called Alto-Adige, which is a semi-autonomous region of Italy and part of Süd-Tirol. It belonged to Austria in the past. Being semi-autonomous means the bureaucrats in Rome don’t get to mess around much with the locals and it shows. Things work well, the infrastructure is in excellent shape, it’s clean and organised. 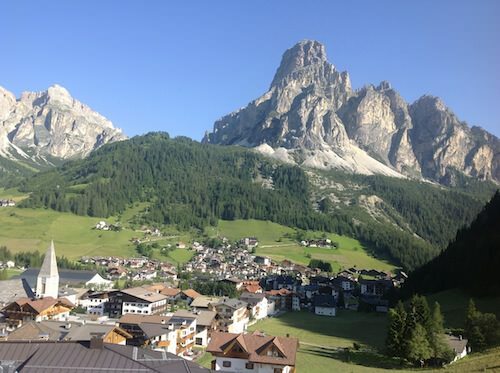 I like Corvara very much because it’s a tranquil place that has rejected the hideous mass tourism junk that blights other ski areas in Europe. Here’s a tip: go to the Rifugio Bioch, which is a restaurant/cafe up in the mountains, not far from Corvara on foot (or by ski lift) with great views and excellent food (make sure you try the home-made pastas and gnocchi). Sit back, relax, enjoy the views. Hotel La Perla has 52 rooms including large suites and there is parking on the premises. If you come in the summer, prices for rooms are less expensive than in the winter (high season). If you are coming from abroad, you can fly into Venice Airport or Munich airport and rent a car. Corvara is in Alta Badia (sub region of Alto Adige) , wich is one of the best kept secret in the World !!!!!! You have to go also in the winter to enjoy the full power of mother nature. Plus best services, best food and also a variety of prices that can accomodate any budget. To me this is how tourism need to be managed all over Italy !!! !